Linkedin is world’s number one professional networking site it is 4th popular networking site. All the professionals all over the world are connected via LinkedIn. LinkedIn has much serious audience than any other social networking sites. Linkedin has 400+ million users worldwide. LinkedIn provides various types of ads like sponsored update, In-mail, job posting and banner ads. LinkedIn job posting ads helps to reach right candidate as we can select candidate based on his job profile, expertise, age, location. 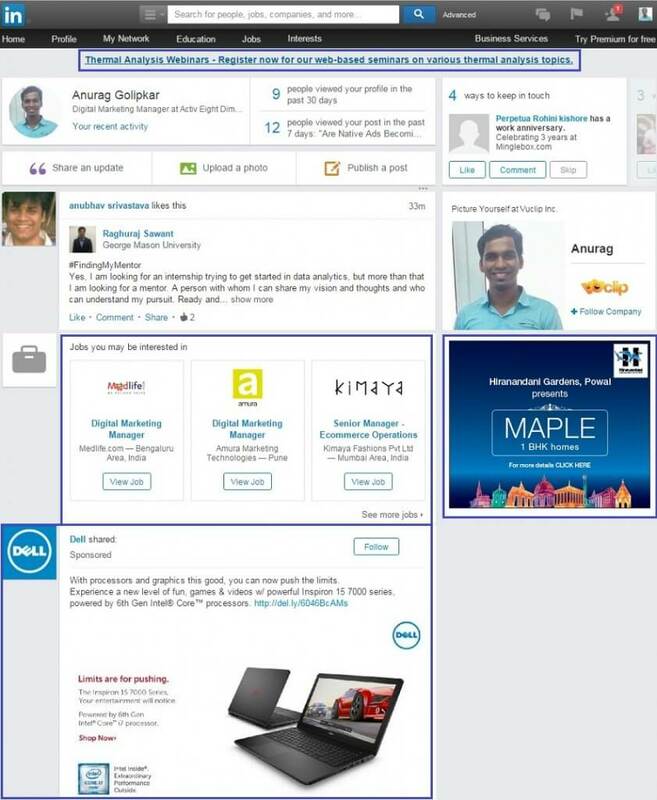 We can also see candidates LinkedIn profile based on our requirement to connect him regarding job openings. 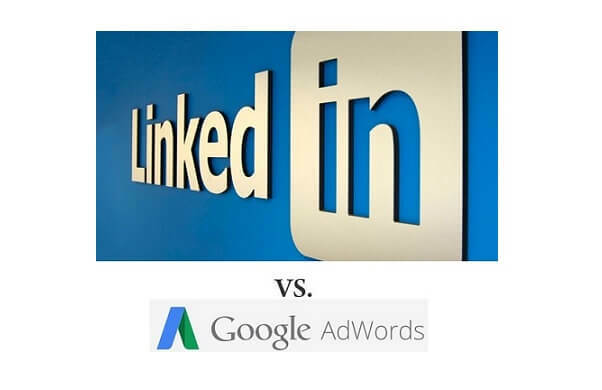 Why LinkedIn ads are better than Google Ads? Google offers various types of ads like text, banner, video, product listing, app installs. Two types of network ads are supported by Google i.e. Search and Display. Thousands of sites are sign up with Google Adsense so Google has mass reach over the world. 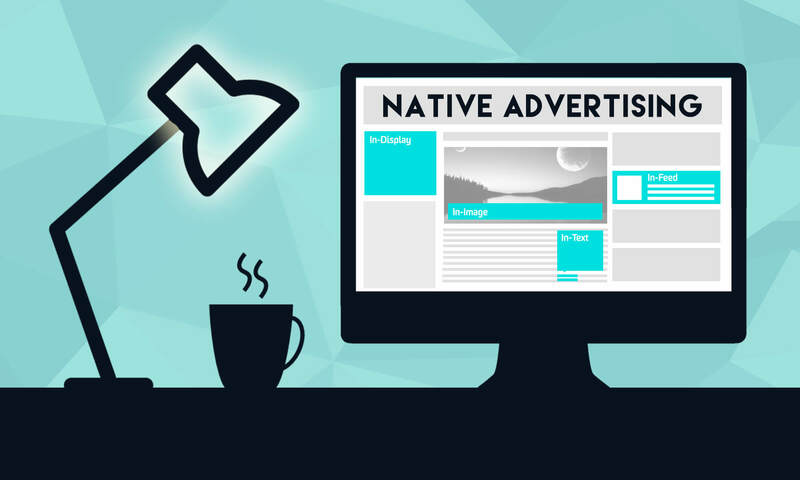 Millions of users visit Google display ads by accessing various sites like news, finance, entertainment, sports, fashion, lifestyle, business etc. So Google Display Networks has vast reach but limited targeting. We can target people by their designation and we target users by their current designation of LinkedIn and Facebook. We can target CxO level people on Facebook but we can have a limited reach as all CxO level people are not comfortable to open FB account so they prefer to open LinkedIn account. Demographic Targeting: It is necessary for users to insert their age group while opening the LinkedIn account. So we can target users by their age group which is not possible on Google as Google offers only three type age groups i.e. male, female and unknown. Google display network has more than 60% unknown users this is why age targeting sometimes get failed on Google Display Network. 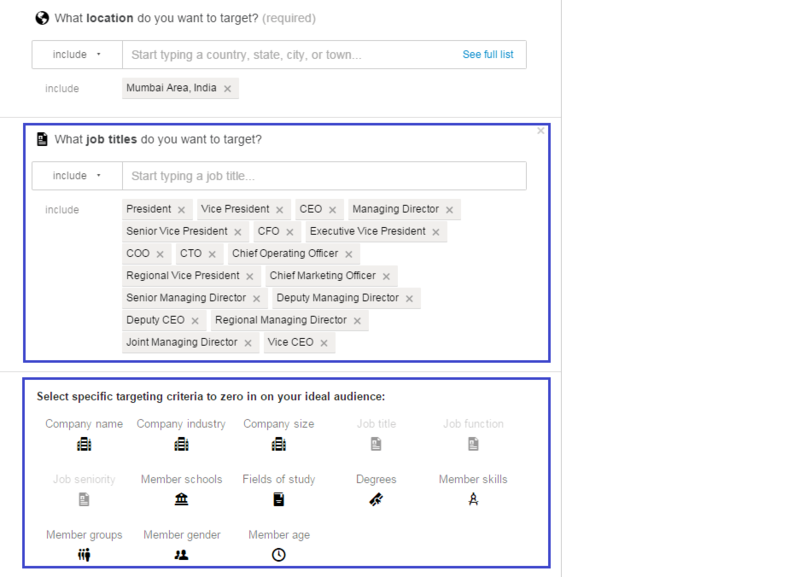 Designation Targeting: We can target users on LinkedIn who are CxO level people e.g. CEO, CFO, VP, President, COO, CFO, CTO, MD etc. We can’t target users based on their designation on Google Display Network. Company Targeting: We can target people who work in specified companies e.g. we can target people in Mumbai who work with CapGemini, TCS, Infosys, Oracle etc. with designation of Project Manager, Assistant Project Manager, Software Developer, Team Leader etc. Estimated Audience Reach: If we set the campaign based on the objective i.e. target location, age group, designation, companies, qualification etc. then it will tell us how much people would be the reach in terms of campaign targeting. This feature is not available with Google Display Network. Recently we run sponsored update campaign for Real Estate client in Mumbai who wanted to promote luxurious properties on LinkedIn to reach CxO level in Mumbai. So targeted people based on their designations. We targeted around 100k+ users in Mumbai and result was outstanding. We got good number of leads. The quality of leads was also good and our client got happy. LinkedIn has a qualitative audience than Facebook, Instagram and Twitter. LinkedIn ads are run to do B2B marketing that is why it is quite different than any other social networking site. Entertainment, Sports, Fashion & Lifestyle, Electronic etc. vendors don’t prefer to run ads on LinkedIn. Digital marketers are now recommending LinkedIn for Real Estate, IT, SaaS, MNCs, Luxury Cars, Luxury Accessories etc. marketing. Conclusion: LinkedIn is no doubt world’s number one professional networking but they still needs improve advertising targeting like radius targeting, device targeting. They also should allow users to direclty run banner and in-mail ads as currently is not supported and their ad experts are taking care of it. I would recommend LinkedIn to make improvements in the ad targeting and not only allow user to run sponsored update ads but also display banners and in-mail ads.